John Allen was born in Southwest Virginia in the middle of the baby boom and developed an early interest in the art of cartooning from exposure to collections of Peanuts and Pogo. After graduating from Roanoke College with a degree in English and some graduate work at the University of Virginia, he worked in book preservation at the UVA library and began to write for magazine cartoonists. The resulting collaborations appeared in such publications as The Saturday Evening Post, Science Digest and The Wall Street Journal. After 16 years at UVA, he devoted himself to cartooning full time, producing Undissolved Mysteries for local papers and writing for syndicated features like Ziggy, The Lockhorns and Frank & Ernest. 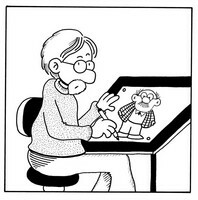 Writing for Nest Heads, created by Steve Dickinson, led to assuming the art duties as well in 2000 and he has produced the strip alone ever since. John lives in Charlottesville, Virginia and his house is a mess.